Today was Bear's last laser treatment. We hope. 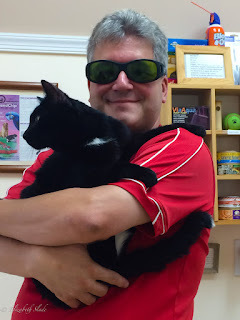 Here is my husband holding him right after the vet finished. As you can see we had to wear special glasses during the process and Bear wanted no part of me taking a picture. oh poor thing I hope the treatments are over.